While either mechanical pencils or regular pencils, with appropriately dark cores, will work on scantron forms, there is some evidence that mechanical pencils have an inherent disadvantage on timed tests that use scantron forms. This is because “regular” pencils have wider tips than mechanical pencils. Thus, the time it takes to fill in each bubble is significantly longer with a mechanical pencil over a “regular” pencil. This won’t add up to much time on short tests. But with timed tests with hundreds of questions, it can make an appreciable difference in the time it takes you to take that test. On that note, perhaps a scantron-form circle stamp with erasable ink should be used to further speed up the process of marking the form. 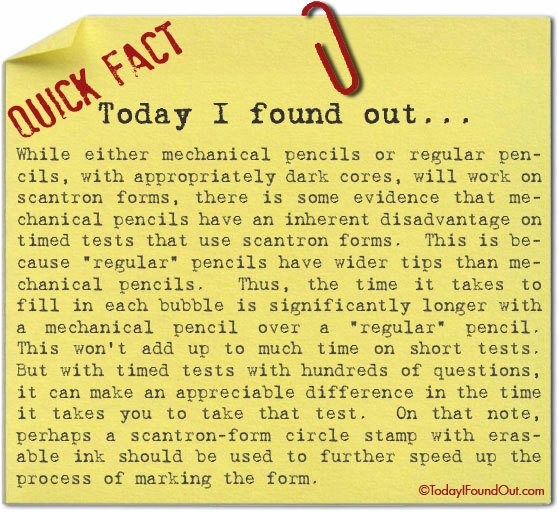 Click Here for Sources and to Learn Why You Used to Have to Use #2 Pencils on Scantron Forms.